We are one of the reputed manufacturers of Red Lentils Color Sorter Machine . Our range is highly appreciated as they provide smooth and fast operation as per the requirements. The products are known for following features like minimum maintenance, long service life and simple installations. The sorters are tested on various parameters ensuring its accordance with the international quality standards. 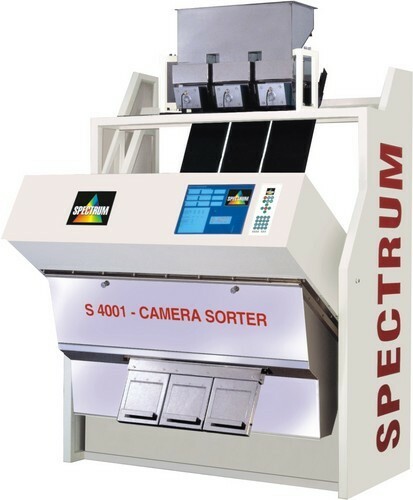 Spectrum Industries is one of the leading manufacturer & exporter of premium quality grain processing machinery such as rice processing machinery, spectrum color sorter, camera sorter, gravity separator, vibro cleaner, vibro grader, bucket elevator, coffee huller, rice cleaning machines, food aspiration and a variety of other grain processing machines. Through our innovative range of products, we have been able to grow and excel in our field of operation with utmost precision. Today, we are amidst the leading manufacturer of seed cleaning and grading machines, along with microprocessors and camera based color-sorting machines in the country. Supported by a team of highly experienced engineers and research professionals, we strive to conquer new milestones in terms of quality and customer satisfaction.